Tags are the easiest way to organize your audience and label contacts based on information you have about them. There are a few ways to target contacts based on tag data. You can do this from the contact table, when you create a campaign, or with an automation. In this article, you'll learn how to send to tagged contacts in your audience. You need to have at least one tag that is assigned to contacts in your audience. Make sure you're familiar with tags and segments. You can target your tagged contacts with emails, automations, or social ads. 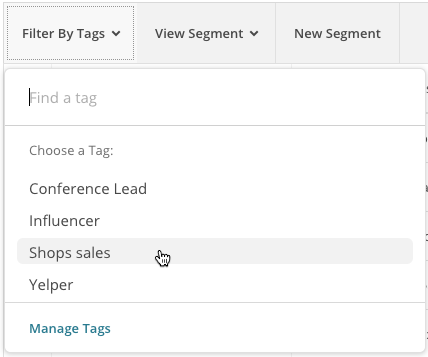 You can target up to 5 tags at a time, or one tag per automation. To target tags with a social ad, you need to have at least 100 contacts in your audience. To send a campaign to tagged contacts from the contact table, follow these steps. Click the Filter by Tags drop-down menu and choose the tag you want to send to. To filter by more tags, click the Filtered By Tags drop-down menu and choose another tag. You can filter by up to 5 tags at a time. Click the Send Campaign drop-down menu, and choose the type of campaign you want to send. You can send a regular email campaign, an ad, or an ad to similar contacts. Continue through the campaign builder to create and distribute your campaign. Awesome! Repeat this process to target more tagged contacts. To send an email campaign to a tag from the Tags page, follow these steps. Find the tag you want to send to. Click the drop-down menu next to the View button, select Send, and choose what type of email campaign you want to send. Nice work! Repeat this process to send an email to another tag. There are a couple of options for sending to tagged contacts directly from the Campaign Builder, depending on how many tags you want to target. You can choose any tag in your audience directly from the Campaign Builder. 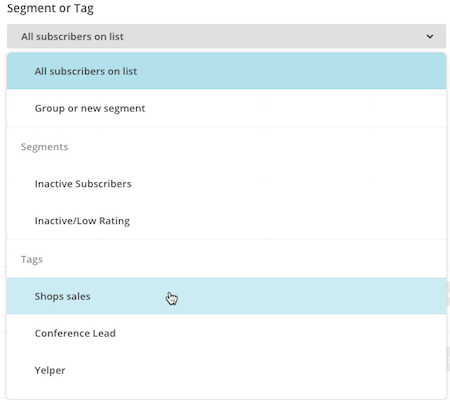 When you select your audience or recipients, choose the audience you want to work with, then click the drop-down menu to choose from your tags, then click Save. The drop-down may vary slightly depending on the type of campaign you’re creating. After you’ve chosen your audience or recipients, click the recipient count to view the contacts included. To create a segment from the Campaign Builder to target tags in your audience, follow these steps. Navigate to the To section of the Campaign Builder. Click the List drop-down menu and choose the audience you want to work with. Click the Tag or Segment drop-down menu and choose Group or new segment. Choose your segmentation conditions. Click the Any drop-down to set the logic for your segment. Any will return contacts that have one one of the tags you specify, and All will only return contacts to have all of the tags you specify. Each tag you specify counts as 1 condition, and you can have up to 5. Click Update Recipient Count to see how many contacts meet your segmentation criteria. When you’re done, click Save and continue through the Campaign Builder. Nice work! You can use these steps any time you want to target multiple tags from the Campaign Builder. 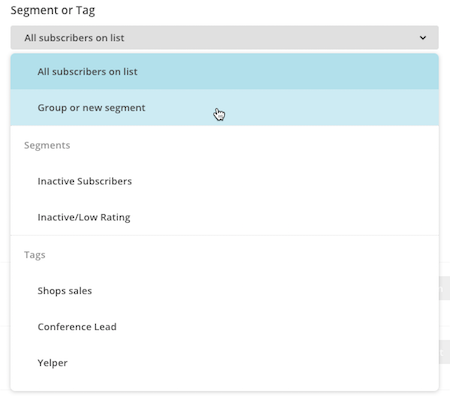 You can also further target contacts by creating reusable, saved segments based on tag data. For example, you might want to target contacts from more than one tag, or combine tag data with other information you have about your contacts. To do this, create a segment with the conditions set to the tag or tags you want to target, and any other segment operators you want to use. Save your segment to reuse it as many times as you need. Use the automation feature to send a campaign when you add a specific tag to a contact. The message can be anything you want to communicate to the tagged contacts, like a special offer or a follow-up after an event. To get started, click the Tags tab when you create an automation, and choose Email your tagged contacts. In the automation builder, edit the trigger settings to choose the tag you want, then schedule and design your automation. Contacts that were tagged before you set up the automation will not receive these emails.